I had the opportunity to meet up with Gillian Brown this week. We inspected the vacant lot where 94 Northampton once stood and admired the architectural detail and structural stability of 11 Holland Place, yet another City-owned residential property, ripe for homesteading. Gillian is a City Court candidate running on the Working Families line in next week's primary race. Two incumbent judges - Eagen and Fiorella - share the same minority party endorsement (as well as the Democratic Party endorsement). Yesterday, I sat down with Gillian and asked him about his candidacy, qualifications and the importance of Housing Court. Here's the podcast (running time 20min). In a poor City where most of the housing stock has a 50-year backlog of deferred maintenance, sky rocketing abandonment and vacancy issues and an ever increasingly longer list of City-owned real estate force so many questions. Few answers. What is clear is that a creative, intelligent and progressive person in elected office can make a difference. 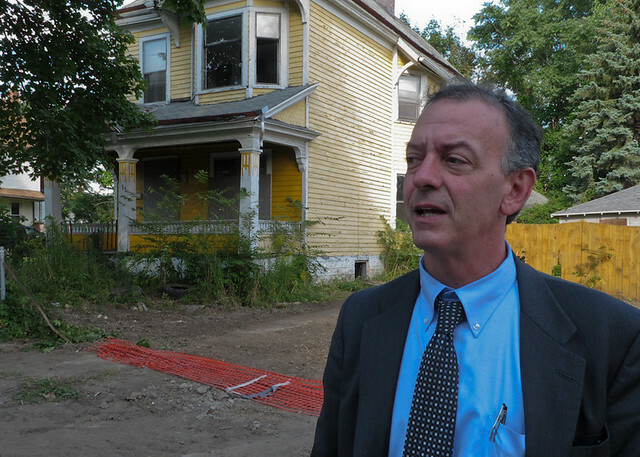 Remember Judge Nowak's Housing Court policies and reforms? Gillian's deep experience representing poor and working class people in City Court as an Attorney and his understanding of housing issues places him in the cross-hairs of what is needed in Buffalo right now. If you are a member of the Working Families Party please vote for Gillian on Primary Day, September 13th. Once the ballot line is secured for the November general election - everyone can vote for the only candidate who actually wants to be in Housing Court. Geoff Kelly over at Artvoice has been covering the pre-primary and the back room drama that resulted in Gillian being removed from the Democratic Party ballot line - see Blackballed, Gillian Brown v. Board of Elections and most recently Blood Sport: How City Court Races turn Ugly. Gillian's next fundraiser: Thursday September 8th at Charlie O'Brian's 865 Elk Street, from 6:00 - 9:00pm. $30 includes beer, well drinks and chicken wings. Here's the website - Gillian Brown for City Court.